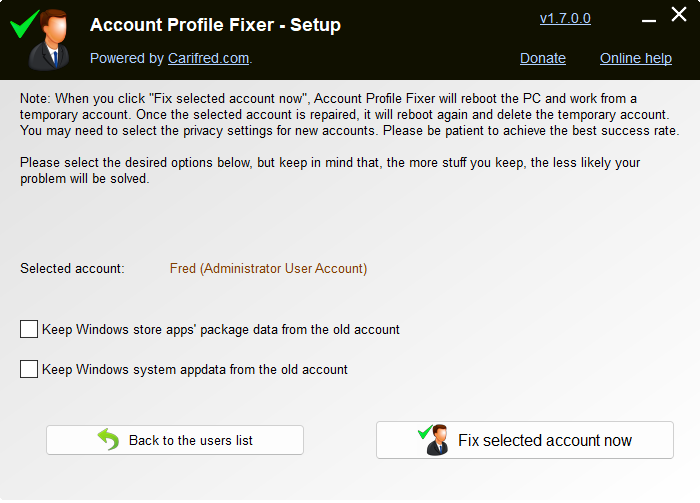 Account Profile Fixer helps you to repair severe issues without the need to reinstall/reset Windows. This tool allows users to easily fix account profile related issues which can not be repaired without creating a new account. Examples of situations where this tool may come in handy are: MS Edge is not working, Windows Store apps are not working, Windows Explorer is not showing the Start screen or the notification area, or a user can not login. Click here to learn more. Current version: 1.3.0.0. File size: 462.87 KB. 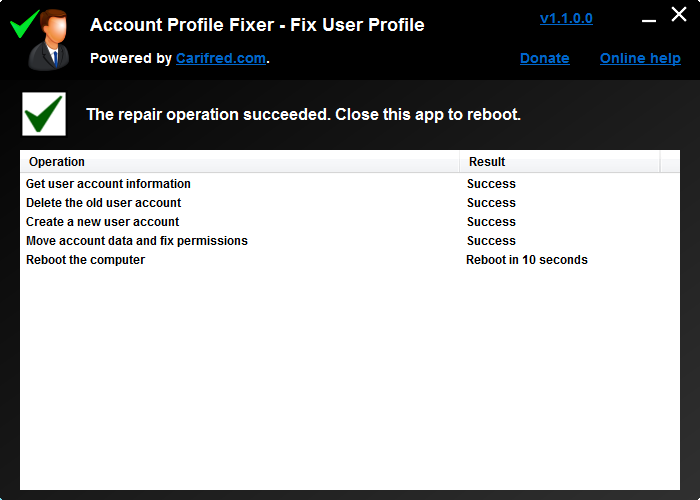 Account Profile Fixer is free software, currently only supported by donations. It is no news for a computer tech that, when nothing else works, creating a new user account to replace a broken user profile can save us from fully reinstalling Windows. Actually, it's one of the things technicians do most, lately. Whether a user lost his password, MS Edge is not working, Windows Store apps are not working, Windows Explorer is not showing the Start screen or the notification area, or a user can not login, we usually end up using the same basic solution: Create a new user account and move the data from the old one. But this process can be lengthy, especially if the user has many files to move to the new account, or the machine does not have a SSD. Not to mention that there are some folders that should not be be moved, or we may risk breaking the new user account profile as well. In the end, we also need to delete the old user account. Account Profile Fixer can take care of the whole process for you. It creates a new user account with the exact same name, profile directory and privileges as the broken one, moves all the data and deletes the old user account. This means you just need to tell APF which account you want to fix, and it will do all the work for you. The process is completely automated; in the end you are automatically logged in to the new, repaired user account. Note: If the user account to repair is a Microsoft account, it will be converted to a local account. You can log in to your Microsoft account after the repair operation, of course. Also, the user login password is removed. You can create a password anytime. Windows store apps may need to be reinstalled. When we launch the application, it shows up the user list, as shown in the screenshot above. 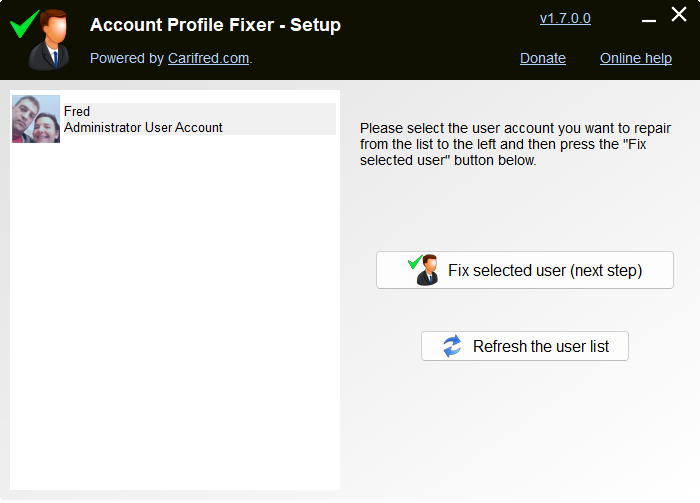 Here we just need to select the user account we want to fix and click Fix selected user (next step). It's OK if you only have one user. Then we can choose whether to keep the folders listed below. These options allow us to choose whether to keep the %LocalAppData%\Packages, and %LocalAppData%\Microsoft\Windows application data folders from the old user account. By default, those folders are deleted. If we want to keep them, we tick the corresponding check mark. Keep Windows store apps's package data from the old account: This options allows you to keep the %LocalAppData%\Packages folder from the old user account profile. This folder is where Windows Store apps save settings, files and other data. If your problem was not related to one or more Windows Store apps, you can keep this folder, so that data from your apps is automatically loaded once you install them in the new user account. Keep Windows system appdata from the old account: This option allows you to keep the %LocalAppData%\Microsoft\Windows folder from the old user account profile. This folder is where Windows saves system settings related to the user. Note that, even if you choose to keep this folder, the user classes hive (UsrClass.dat) will still be replaced with the one from the new user account. Once you select the user account to repair and the desired extra options, and confirm, APF will create a temporary admin account, reboot the computer and automatically log into that account. 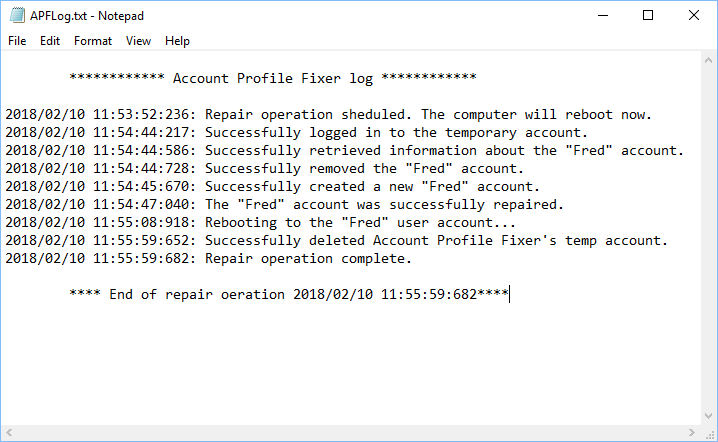 Working from the remporary user account, APF will delete the broken account, create a new one and move the data from the old profile to the new one, as shown in the screenshot below. In the end APF will reboot again, automatically log into the repaired user account, delete the temporary account, and display the repair operation's log.